Deccan Tiffin offers you a fine dining experience in a nostalgic setting reminiscent of early 20th century British India. Most of my supperclubs are held at my Victorian Villa in Hove near the seafront which is perfect for hosting up to 24 people at a time for a lavish, multi course, sit down meal. The people who come to my supperclubs are foodies and not necessarily just curry or Indian food enthusiasts. Ever since I can remember, I had a passion for the richness and variety of food in India. 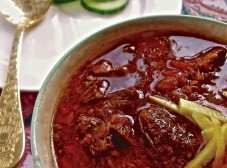 I grew up in North Delhi where there were many different communities with very distinct cuisines – the Muslims from Uttar Pradesh and Delhi with their Awadhi and Mughali cuisines; the Vaishya cuisine of the vegetarian Guptas and Agarwals; the diverse cuisines of the Kayasthas, Biharis, and Kashmiris. I was one of those annoying kids who was always in my neighbours’ kitchens asking questions. All the wonderful Aunties and grandmothers would always patiently explain and show me how they made a particular dish. My curiosity was endless and continues until this day. With it also went a desire to recreate those dishes at home for friends and family. It has been a hard but immensly enjoyable slog to establish myself and not easy where everything about Indian food seems to have been done or said already . But I feel I have a unique voice because of my deep understanding of Indian flavours and traditional cooking techniques. My life has been a constant journey – I was born in London while my father was a student at SOAS, University of London and spent some years of my childhood in the States as well while he was doing a doctorate at Yale University. But we all returned to India and I spent my teenage years in Delhi, which is a melting pot of north Indian cultures and cuisines. My parents were both Brahmins – my mother’s family were the head priests of the famous temple in Narsoba Wadi in Maharashtra and my father’s family were zamindars. However both moved to Mumbai at a very young age after land reforms and other changes to try their luck in the city. Their culinary journey started there. It was in Mumbai that my father first experimented with eating meat and dressing in western clothes; my mum followed with the meat eating but never wore anything other than sarees her entire life. By the time they were in England they had shed all their Brahminical food habits and I remember my mum telling me how much she had enjoyed Sunday roasts! I was an omnivore from birth, and continue to be one today. Both my parents were keen cooks – uncharacteristically for his generation, my father would often be in the kitchen experimenting with different things and I would be his keen helper. Although he was an internationally renowned scholar with a modern outlook on life, he was insistent that I learned to cook well. I also learnt how to cook from my grandmothers and many neighbourhood Auntijis who were all great cooks. Although I was rarely in charge of cooking an entire meal, I was, like many other children in Indian families, expected to help around the kitchen, cutting, chopping, organising spices and ingredients and generally being the assistant. Lucky for me we had cooks only for making things like chapatis and daals – the rest was down to us and thats why its so ingrained in my consciousness. I rarely use measures to cook and that is a skill that I acquired when I was very young. I named the company Deccan Tiffin to acknowledge my parents who were born in the Deccan Plateau.